Did you know that you can use Musiah very effectively with a touchscreen? 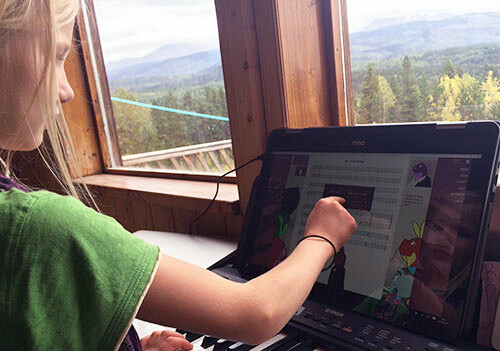 Musiah Unity is looking great and kids like it even more on a New Inspiron 17 2-in-1. Large screen plus touch works beautifully with Musiah. As we continue doing the ground work for an iPad version to be released in the near future [see update above], the benefits of developing Musiah for the iPad are already spilling over to the existing computer versions of the software particularly for students like Anna who use touchscreens. So if you happen to have access to a touchscreen, it's definitely worth ditching the mouse and giving the touchscreen a go. If you have not yet tried Musiah Unity, I warmly invite you to take our Online Piano Lessons 14 Day Free Trial. And if you have any questions about Musiah's piano lessons, please feel free to contact me directly.